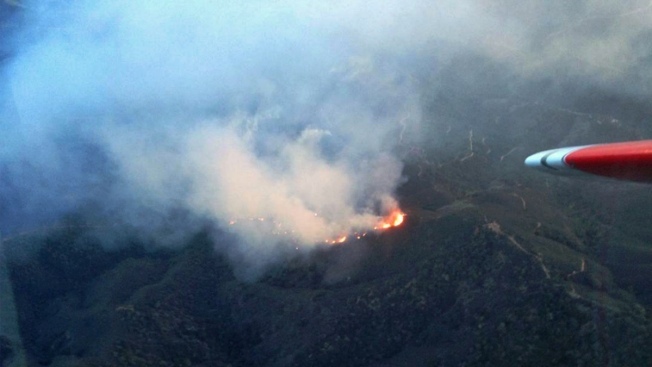 The wildfire is seen in this aerial photo taken Wednesday, March 19, 2014. About 200 firefighters are battling a 400-acre wildfire that began when a prescribed burn on private property escaped containment Wednesday evening near Salinas, according to a Cal Fire spokeswoman. At about 6:20 p.m. on Wednesday Cal Fire and Monterey County Regional Fire District firefighters responded to a report of a wildfire burning on Encinal Road, located about 8 miles southeast of Salinas, Cal Fire spokeswoman Jennifer Valdez said. The property owner reported the blaze, advising that he had lost control of a prescribed burn and needed assistance. Due to the remote location, firefighters have had difficulty accessing the fire, which has spread into surrounding heavy brush. The fire grew from 300 to 400 acres overnight and as of 10 a.m. was only 30 percent contained, Valdez said. No structures are threatened by the blaze and no injuries have been reported, according to Valdez. Fire crews are battling the blaze from the sky with two air tankers and at least one helicopter, Valdez said. Cal Fire officials said that due to the unseasonably hot and dry conditions in the region, they have been operating above normal staffing levels, allowing them to respond with more resources than usually available in mid-March. Valdez said the property owner had a permit for the prescribed burn.